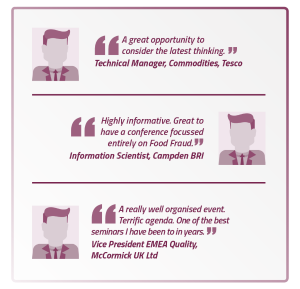 Discover and discuss the latest in; Traceability Systems of the future, From Slavery to Sustainability, Investigation & Criminology and what happens if the food fraud squad turns up at your door. Co-Chaired by Chris Elliott, Professor of Food Safety, Founder of the Institute for Global Food Safety and Pro Vice Chancellor, Queen’s University Belfast and Helen Sisson Group Technical Director, Greencore Group and Co-Chair of Food Industry Intelligence Network, this conference will once again bring together global food manufacturers and processors who need to keep up-to-date on the latest regulations. Visit the website and download the programme here.